Fox keeps promoting Joel Rosenberg as a "Russia expert" based on his book. It's a novel. 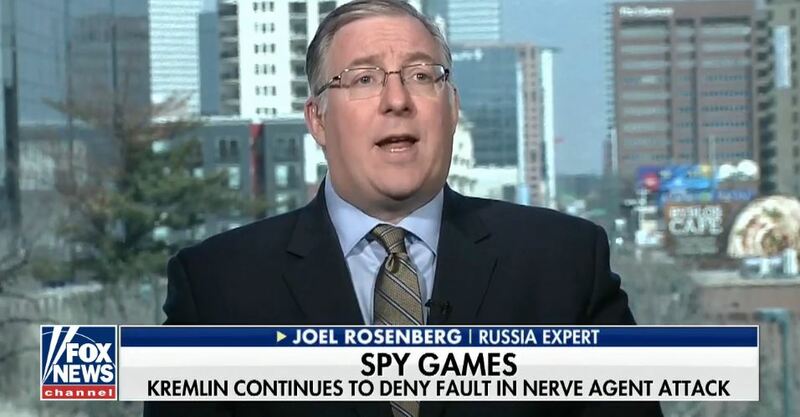 Fox News has repeatedly aired the Russia commentary of the author Joel C. Rosenberg over the past few weeks, credentialing him as a “Russia expert” and pointing to his recent bestseller, The Kremlin Conspiracy. In an appearance on the network and in packaged reports, hosts and contributors of the network’s putative hard news programs have described Rosenberg as “the author of a very important book,” a “New York Times bestselling author and author of the brand new book,” and “the author of the bestselling book The Kremlin Conspiracy." There’s just one problem: The Kremlin Conspiracy isn’t, as the title might imply to those hearing of it from Fox personalities, a work of history, or political analysis, or journalism. It’s a political thriller. The fact that The Kremlin Conspiracy is a novel is rarely addressed when Fox features Rosenberg’s Russia commentary. In packaged reports that aired Monday night on Special Report and Fox News @ Night, Fox White House Correspondent Kevin Corke referenced Rosenberg’s book and aired an image of its cover. In both cases, he then aired a clip of Rosenberg -- described in the caption as a “Russia expert” -- commenting on the U.S. decision to expel Russian diplomats in response to that country’s alleged involvement in the poisoning of a former Russian spy in the United Kingdom earlier this month by calling for an even harsher response. In neither case did Corke note that The Kremlin Conspiracy is a work of fiction (though small text on the cover he aired does describe it as “a novel”). Likewise, when Fox News @ Night host Shannon Bream hosted Rosenberg to discuss Russia earlier this month, she introduced him as “New York Times bestselling author and author of the brand new book The Kremlin Conspiracy.” It was Rosenberg himself who mentioned in passing that the work was a novel, as he drew comparisons between its fictional antagonist and Russian President Vladimir Putin. Rosenberg has also written and spoken extensively about the various "signs" indicating the second coming of Jesus Christ may be imminent (including the "supersign" that was the "rebirth of Israel in 1948"). 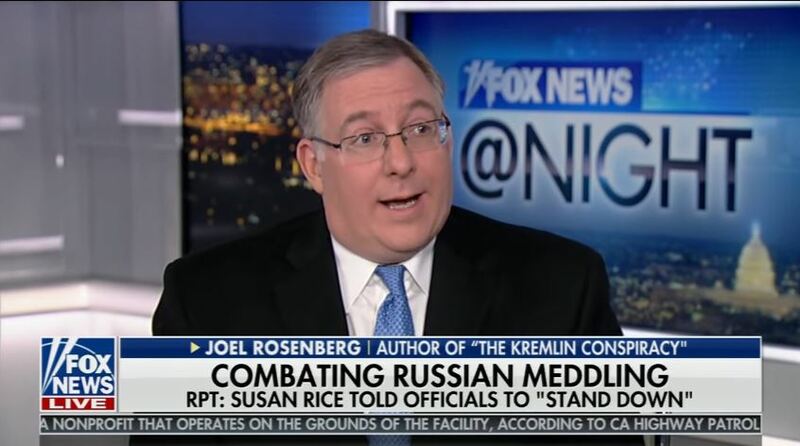 Fox has repeatedly hosted Rosenberg, either credentialing him as a national security expert or bringing him on to discuss whether particular events -- such as the civil war in Syria -- indicate the approach of the biblical End of Days. He was a particular favorite of former Fox host Glenn Beck, not only appearing on his TV and radio shows but also featuring prominently in Beck’s documentary Understanding the Holy Land, which gives a history of Israel through the lens of its role in End Times prophecies. Following the arrest of former Democratic information technology staffer Imran Awan, far-right media and Fox News pushed multiple conspiracy theories about him, suggesting he was behind WikiLeaks getting hacked Democratic National Committee (DNC) emails, that he had damaging information on House Minority Leader Nancy Pelosi, and that the Clintons were somehow involved in the situation. Right-wing media have waged a months-long attempt to discredit the 35-page dossier produced by a former British intelligence officer that contains allegations of coordination between the Trump campaign and the Russian government. Various right-wing commentators have described its contents as “unreliable,” “discredited,” “largely debunked,” and "evidence of ... collusion between Democrats and Russian disinformation," including a Washington Times story that Trump promoted this week. But, according to numerous reports, American intelligence officials have “verified” various “core” aspects of the dossier. Will right-wing media call out Georgia GOP leader for politicizing Scalise’s shooting? Right-wing media have been quick to criticize politicians and activists for “politicizing” mass shootings by talking about gun violence prevention in their wake. But after a GOP official in Georgia suggested that the June 14 shooting in Alexandria, VA, which critically injured House Majority Whip Steve Scalise (R-LA) and four others, “is going to win this election for us,” will conservatives care enough to call out the clear exploitation and politicization of the shooting? Carver isn’t advocating for a solution to gun violence, but rather he is celebrating the potential political advantage the shooting could bring. Despite Carver’s blunt politicization of the shooting, it seems unlikely that right-wing media will break from their campaign against Democrat Jon Ossoff to speak out against it. Fox's White House Correspondent Downplays Trump's Threat To Cancel Press Briefings As "The Game In Washington"
Media shouldn’t be so willing to let White House press secretary Sean Spicer off the hook for his comments comparing Syrian President Bashar al-Assad to Adolf Hitler given the implicit and explicit ways President Donald Trump and his administration have embraced white nationalists. No matter how ineffective, Spicer’s comparison is another example of a wink and a nod to the type of hatred that is a part of this White House’s culture. Trump hired Stephen Bannon, who previously ran Breitbart, a "platform for the” white nationalist “alt-right" movement as his chief strategist -- a move that was lavishly praised by white nationalists. In a closed-door meeting, Trump reportedly suggested that an onslaught of anti-Semitic incidents were false flags, an assertion repeatedly made by white nationalist media figures. Previously, Trump had refused to condemn the incidents while berating a Jewish reporter. The White House failed to mention the Jewish people in a statement commemorating International Holocaust Remembrance Day. Trump refused to disavow former Ku Klux Klan grand wizard David Duke during an interview with CNN, drawing praise from his neo-Nazi supporters. Former Trump adviser A.J. Delgado retweeted a Trump endorsement from the anti-Semitic hate site The Right Stuff. Trump’s senior counselor Kellyanne Conway tweeted “love you back” to an anti-Semitic Twitter account. Media figures are wrong to simply dismiss Spicer’s Holocaust comments as a hiccup. The connections between the Trump team and the white nationalist community are too strong for Spicer’s comments to be treated as a one-off. Spicer’s blunder is emblematic of the administration’s continuing effort to wink and nod at -- and sometimes openly embrace -- its white nationalist supporters. Fox's Special Report Falsely Claims Obama's New Smart Gun Technology Push Is "Flat-Out Dangerous"